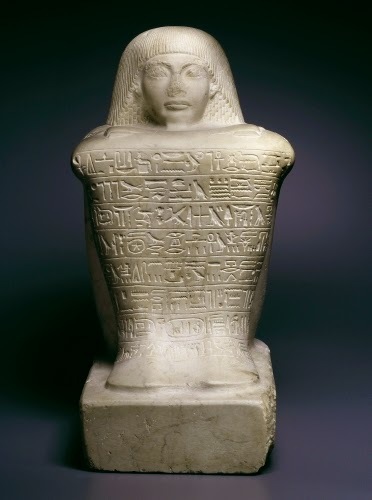 Going all the way back to the earliest dynasties of the Old Kingdom in Egypt (ca. 2650–2184 BCE), the realistic depiction of human beings and animals is readily evident. Naturally, the realism was softened when depicting rulers or members of the nobility so that they looked like fresh, young, perfect human beings. For more humble officials and their families, the realism was often more spot on. Even in the hyper realism, though, there is a stiffness and simplification of forms that could “hint at abstraction.” This may be partially because of the block-like, rigid formality of the pose of the figures, a convention that lasted almost 3000 years in Egyptian art. 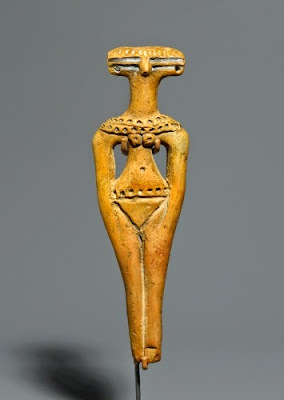 This figurine dates from the Second Intermediate Period in Egypt, ca 1696–1539 BCE. This was a chaotic period when the Hyksos, a Semitic people from the east, invaded and occupied northern Egypt. They ruled as the Fifteenth Dynasty, while Egyptian princes of the Thirteenth, Sixteenth and Seventeenth ruled southern Egypt from Thebes. Kamose (reigned ca. early 1540s BCE), the pharaoh in Thebes began a rebellion that eventually led to the destruction of the Hyksos dynasty. His brother Ahmose (reigned ca. 1539–1514 BCE) restored a united Egypt under Dynasty Eighteen. The purpose of this figurine is not known, although it bears similarities to pre-dynastic female and male figures that are extremely simplified excepting, the details of their anatomically specific parts. Compared to the realism of funerary sculpture of this period, this is refreshingly original. Various theories explain this figurine as Nubian (Kushite), the Upper Nile culture, or simply the product of an “unofficial” artist who was not following the accepted artistic conventions. 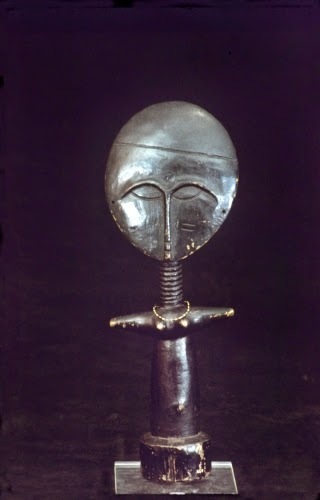 It reminds me of the abstract Akua ‘Ba figures from the Asante culture (traditionally matriarchal) in Ghana that were traditionally carried by girls to help teach them about motherhood, and by pregnant women to ensure a healthy birth. The Akua’Ba are marvelous abstract summations of some of the traditionally held ideals of feminine beauty. Here are a couple more examples of ancient Egyptian abstraction. I really like the block expressions of individuals, so similar to the seated scribe genre. 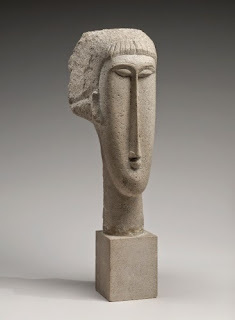 And do we see a little Giacometti in the standing male figure? And here is a 20th century artist who was there when they “invented” abstraction in the early 1900s. I wonder which inspired him more: ancient art or “primitive” art?